The feast of Pentecost is considered the birthday of the Church. It was on this day two thousand years ago that the Holy Spirit descended upon the Apostles in the upper room and together they were changed forever. These first leaders of the Church were transformed by the Holy Spirit from fear into holy courage that enabled them to proclaim the Gospel with great boldness to people from, “every nation under the sun.” The Church could not exist without the Holy Spirit; Christianity cannot be sustained without the Holy Spirit. In the second reading St. Paul describes what it means to live by the Spirit. He says, “Now the works of the flesh are obvious: immorality, impurity, lust, idolatry, sorcery, hatreds, rivalry, jealousy, outburst of fury, acts of selfishness, dissensions, factions, occasion of envy, drinking bouts, orgies, and the like.” All of these are obstacles to the presence of the Holy Spirit and threaten our salvation. It would do well for us to make note of this list and to use it as an examination of conscience to prepare us for confession. Some of the items mentioned may seem acceptable in our present culture, but they are just as dangerous now as they were two thousand years ago. How Can I Live By the Spirit? In the second reading, Paul mentioned some of the sins that are obstacles to the presence of the Holy Spirit. All serious sin drives the Holy Spirit from our soul, but we have the means to be renewed in the Holy Spirit through the sacrament of Confession. The Holy Spirit will help us to forgive others and to forgive ourselves. He will help us to make a commitment to pray every day, and to do the things we know we should do but find it difficult to do. It is the Holy Spirit who will help us to deny ourselves and make sacrifices on behalf of God, the people we love, and others. Making sacrifices for the people you love brings great joy and deepens love. Every day, throughout the day, we should ask for the assistance of the Holy Spirit in the decisions we make and in the advice we give and the advice we ask for. We have received the Gifts of the Holy Spirit, but we should pray for an awareness of which gifts He would like for us to develop for the good of the Church. It is through active participation in our faith community that we will most likely discover the gifts that Our Lord wants to develop in us. We are created in the image and likeness of God and one of our most important attributes is our spirituality which we are responsible to develop. How much time do we spend in spiritual formation? How much time do we spend in prayer, adoration and worshiping God, Scripture reading and reading the lives of the saints and Church documents? How much time do we spend talking with others about the truths of our faith? If we do not share our faith with others, we are failing to fulfill our baptismal responsibilities. In his homily at the Pentecost Vigil Mass, Archbishop Gustavo Garcia-Siller, a Missionary of the Holy Spirit, stressed three things. He asked the people of San Antonio to pray with great fervor to the Holy Spirit for the protection of religious freedom which is being threatened in this country. He asked that we pray for an outpouring of the Holy Spirit so that we all may have a deeper faith formation especially as we approach the “Year of Faith” which begins this fall. And finally he asked that the people of the Archdiocese pray for unity as the leadership team plans for the future of the Archdiocese of San Antonio, and of course to pray for vocations. God has a great plan for humanity and through His Church and His gifts He has made it possible for everyone to discover and live that plan, but we must choose to live by the Spirit. This blog was originally preached by Deacon Tom Fox as his homily for Pentecost Sunday (B) at St. Matthew Catholic Church in San Antonio, Texas. One of my conversion experiences was when I encountered the Risen Lord. It was at a time in my life when I was searching for healing, for consolation. Shortly after my search for God, I truly did experience Him: I was healed of an incurable illness through the healing power of the Holy Spirit! That encounter changed my life. My search turned into a search to learn more about the Risen Lord Jesus, His teachings and His Church. One of my discoveries in my search (which never ends!) was the presence of the Holy Spirit in the Church and in my life. I read about ‘The Coming of the Holy Spirit” in the Acts of the Apostles (2:11-13) and came to truly believe it happened 2,000 years ago—and continues to happen today! Another remarkable experience with the Holy Spirit was in the Holy Land. One of our pilgrimages to the Holy Land fell during the Feast of Pentecost. My husband Tom and I were spending time with our spiritual mother, a Franciscan nun, Sister Bernarda. She invited us to attend a Pentecost Prayer Service in the Upper Room in Jerusalem with other religious (Franciscan priests, brothers, nuns) and lay persons. They all served in the Holy Land in various capacities and come from various countries. The Service was in Latin, the mother tongue of the Catholic Church. However, when it came to praying the Lord’s Prayer, everyone was invited to pray in their own native tongue. The Upper Room is a simple, large room with a couple of open doorways. As we prayed the Lord’s Prayer, the room was filled with joy and peace! This is how it was 2,000 years ago! Imagine how we must have felt—being at the site of the Upper Room in Jerusalem with Christians, praising God and hearing various tongues on the Feast of Pentecost! Tom and I praised God for this unique experience! That day, we experienced the Holy Spirit—the love of God the Father and of Jesus, Son of God. The Holy Spirit became for us a bridge between God and others. Each day, we beg the Holy Spirit to guide us and lead us in our daily walk with Christ. The Holy Spirit is the unconditional love of God. The Holy Spirit offers us His gifts that no one else can offer; His gifts are priceless and can lead us to a life of peace, joy and hope! This year, the Church celebrates Pentecost on Sunday May 27th, 50 days after Easter. Take advantage of these next few days before Pentecost (or any day) to implore the Holy Spirit into your life, by asking Him to ‘stir within you’ a desire to know and love God and in doing so, you will indeed be on the road to true peace, joy and hope! Come, Holy Spirit, fill me with your peace, guide me with your wisdom and grant me what is necessary today in my walk with Christ Jesus! 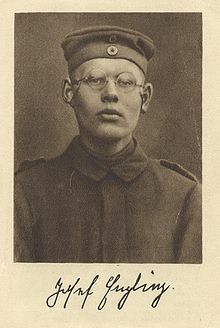 Drafted into WWI German army at 18 years old, Josef Engling didn’t live to see the war’s end. His life lasted only 20 years, but his legacy continues today through a spiritual movement called Schoenstatt – of which Josef was a founding member. Why does he remain so influential? Well, he was just like you and me: teased for his crooked walk and slurred speech, engaged in the struggle to live a good life – even when he felt confused, useless or weak. I want to become all things to all people and to belong totally to Our Lady; I want to be faithful even in the smallest things and to carry out the ordinary things in an extraordinary way. Easter 1916, before the war: Josef was a seminarian with the Pallotine Fathers in the Schoenstatt region of Germany. But he was feeling lost. Even with Easter’s celebratory atmosphere, his spiritual life was weak. (I can relate!) Sitting in reflection, he looked around him and noticed all the flowers in bloom. …and he began a list of “blossoms” he would offer her. Notice how easily we can imitate this young man’s novel idea. As the rose is the queen of flowers, so you be the Queen of my Heart. I place everything at your disposal, my Queen. Each of Josef’s ordinary, everyday activities were transformed into gifts for the Mother of God – his own spiritual Mother. As time passed, his growth and maturity was noticeable. Soon all the young men who lived with Josef adopted this practice. On Sundays, they would draw pieces of paper from a margarine tub containing their “blossoms” for the week. The priests who oversaw the boys were surprised at the tremendous increase in respect, order, kindness, and spirituality among them. Mother, if it wasn’t for the support I feel from you, I would be totally confused and nervous. Today, my company is resting from the fighting – except for myself, who must stand guard. Tomorrow, it will be the same. I am so hungry and thirsty, with little hope of getting letters. All I receive is the mockery from my comrades. But my love for you helps me bear everything. I want to become a great saint. Shouldn’t I take all that is happening now with patience and serenity? You see? Josef was normal like us; the Christian life was still a struggle. But he knew he must follow after Jesus and daily take up his cross. Josef’s fellow soldiers mocked his schedule of prayer and penance. But, wishing always to please his beloved Mother Mary and Her Son, he stuck with it. We have a host of friends in Heaven by our side, cheering us on – first among them, our Mother. We can do this. My husband and I usually go to Mass on Saturdays at 5pm. As we drove up to the church at around 4:35pm, the parking lot was already filled. I began to wonder, What in world is going on? We found a parking spot and then proceeded into the church. The church was so packed that there was barely any seating left. As I tried to find a seat, I realized all these people were here for a celebration – but what? Then, I remembered that the priest told us last Saturday that at the 5pm Mass, they were going to celebrate First Communions. My husband and I tried to find a seat up front, but most of the people were saving it for their family members. So, my husband and I decided to leave. You see, we are fortunate to live in between two parishes! We decided to leave and go to the other parish for Mass instead. It was a good thing we did; the priest had a great homily! The reading for this Sunday was from the Gospel of John 15:1-8. Just in case you’re not familiar with this reading: it’s about Jesus being the Vine, and we are the branches. The priest really caught our interest in demonstrating his homily with an actual plant – saying Jesus is the Vine and that God is the Grower. We are the branches on that Vine, and the Father would be pleased to see the branches bear fruit. As long as we remain in Him, we will be that branch bearing fruit. Well, how can we remain in God? I began to ask myself. “Abide in me and I in you.” The more closely we are united to Christ by faith, charity and good works done with the intention of pleasing God, the more intensely will he live in us and bestow on us continually a new life of grace. Thus we shall become, not merely living branches, but branches laden with fruit, the fruit of sanctity destined to bring joy to the heart of God, for Jesus has said: “in this is my Father glorified, that you bring forth very much fruit” (John 15:8). So instead of being out in the hot sun, working hard on your back or front yard, work on your own inner garden and bear that fruit so all can see God glorified in you!! !